The diamond choker worn by Kacy Hill at the Fifth Avenue Mansion party was made by Cartier in Paris in 1906. 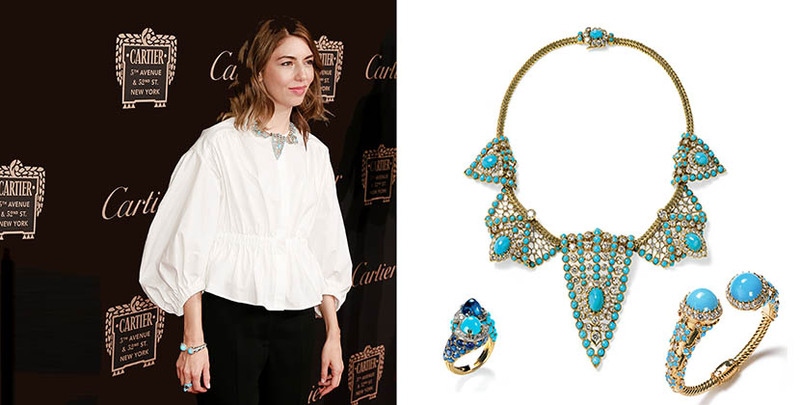 Sofia Coppola in vintage turquoise, gold, diamond and sapphire jewelry from the Cartier Heritage Collection in Paris. A good party has all kinds of surprises. When Cartier threw its big bash to reopen the Fifth Avenue Mansion on September 7, 2016 there were several. Dancers from the New York City Ballet performed a pas de deux. DJ Paul Sevigny spun vinyl on the new rooftop party space. Artists Chuck Close and musician Patti Smith swung by to check out the goings on. The big jewelry surprise of the evening was to see several pieces from the Cartier Heritage Collection take a turn on celebrities at the event. Previously, these jewels from the esteemed collection of historic items kept in vaults in Paris—in other words they are not for sale—had only been seen publicly behind glass in the museum exhibitions or in the pages of books. 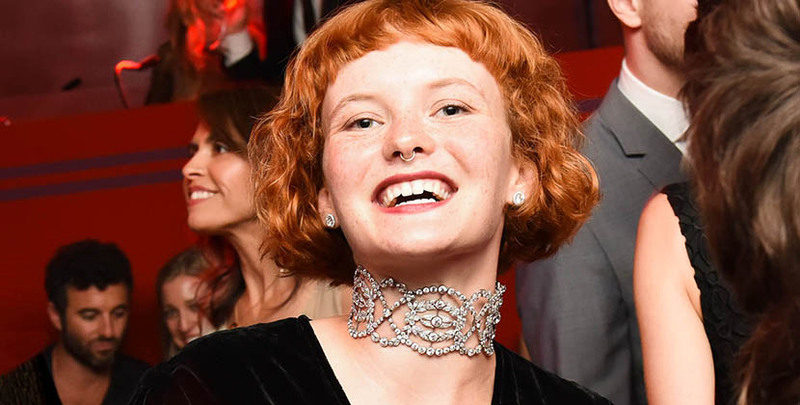 “This choker is EVERYTHING,” wrote singer and songwriter Kacy Hill on her Facebook page about the jewel she wore at the party and while performing a couple of her stirring songs seated on a swing above the crowds in the high jewelry room at the mansion. Cartier in Paris made the special commission piece for American socialite Mary Scott Townsend in 1906. It is set with an array of various sizes of round diamonds in platinum with millegrain details along the edges. 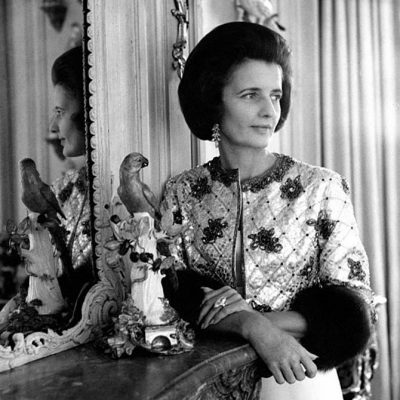 Back in the day Mrs. Townsend who lived in Washington, D.C paired the jewel with her elaborate Cartier tiara and huge Lily stomacher brooch that was approximately 10-inches in length. Kacy made the over 100-year old jewel shine in a modern way wearing it with a velvet jumpsuit, diamond studs and septum ring. Director Sofia Coppola put on three mid-century Cartier jewels with a white shirt, cropped black pants and gold shoes. The trio was not a matching set but they coordinate and were displayed together at the Denver Art Museum’s exhibit Cartier in the Twentieth Century. 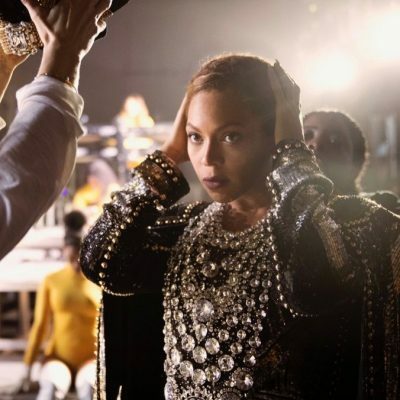 The turquoise, gold and diamond bib necklace was made by Cartier in Paris in 1955. Her bangle bracelet set with the same three gems was made two years earlier and originally belonged to a member of the Rothschild family. The ring sparkling on Sofia’s finger shows how the turquoise jewelry style of the fifties transformed into a even more glamorous mode in the sixties. Made by Cartier in Paris in 1967, the Toi et Moi ring features a 3.56-carat sugarloaf sapphire and cabochon turquoise on top of a bypass style band covered in the same two blue stones with diamond accents. Maria Félix’s epic diamond snake necklace was the most famous Cartier Heritage jewel to appear on a guest at the party. It was worn by Italian socialite Bianca Brandolini d’Adda with a simple slip dress. 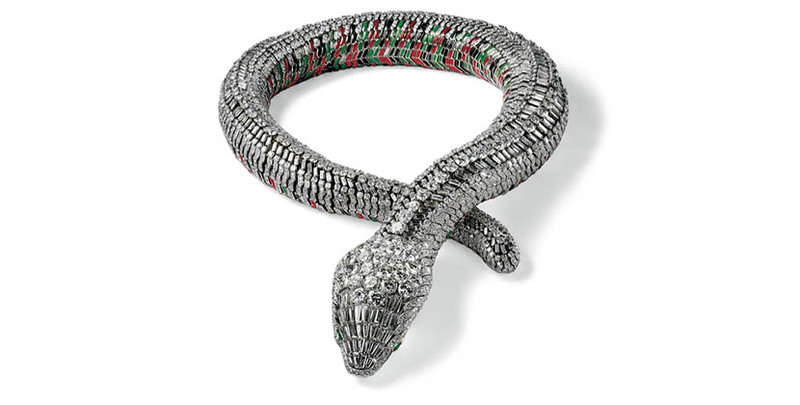 Commissioned from Cartier in Paris in 1968 by the Mexican film star, the over-the-top jewel is 22-inch long and as thick as a real snake. 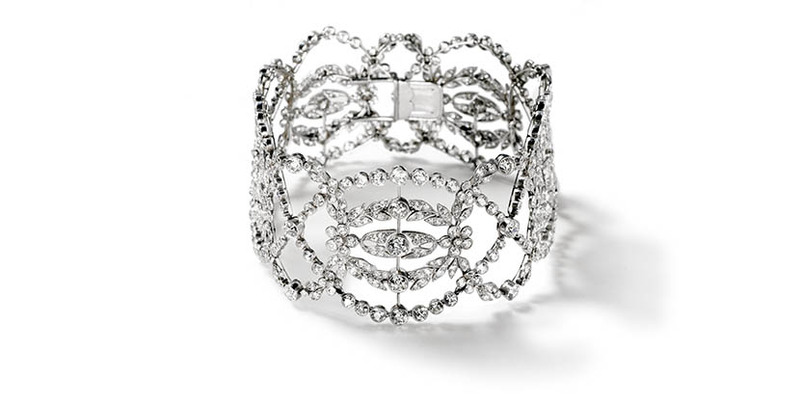 The white gold and platinum design is set with 2,473 diamonds weighing a total of 178.21-carats. The round and baguette shape gems along the top of the body give the serpent a sense of movement. An array of tapered baguettes form a funnel shape along the head. Two emerald eyes peer out from the front. The bottom of the creature is covered in red, green and black enamel scales. The appearance of the the Heritage jewels on the big night gave the evening extra elegance and the eternal edge of Cartier style.